Poised at the starting line for the legislative process, the House Ag Committee has been delayed by partisan disagreement over controversial changes to the Supplemental Nutrition Assistance Program (SNAP). SNAP may be the most controversial and partisan issue but it is not likely to be the only challenge to completion of a farm bill in 2018. Congressional rules that seek to enforce budget and spending disciplines generally require that increases in spending for one program be offset by reductions in other programs; rules that create competition for limited funding. Recent decisions by USDA provide an example of the interaction between the demands for assistance and those for budget discipline. They may also signal increased competition for baseline funds in a farm bill process. In general, Congressional budget rules seek to discipline Congressional spending using two interconnected mechanisms. First, the Congressional Budget Office estimates outlays for a ten-year budget window; estimates that create the baseline for existing programs authorized in the farm bill (Levit, 2014). When Congress seeks to reauthorize programs, it is generally required to stay within the baseline spending estimates. As a result, spending increases for one program must be accompanied by spending decreases in other programs to offset the increases. Second, Congress has created budget enforcement mechanisms, the most commonly used being pay-as-you-go (PAYGO) rules and sequestration (Saturno, 2011). In general, PAYGO forces offsets for new spending and the PAYGO scorecard is also part of the sequestration process. Finally, the Administration through the Office of Management and Budget (OMB) generally applies internal PAYGO rules for any agency decision that results in new spending (Brass and Monke, 2010). The 2014 Farm Bill provided a case study for how budget discipline can drive policy development. Political pressures to reduce spending coincided with high crop prices and strong farm incomes as Congress worked through the farm bill reauthorization process. Policy development under budget pressure resulted in elimination of direct payments but also a shift in funding and priority to crop insurance. 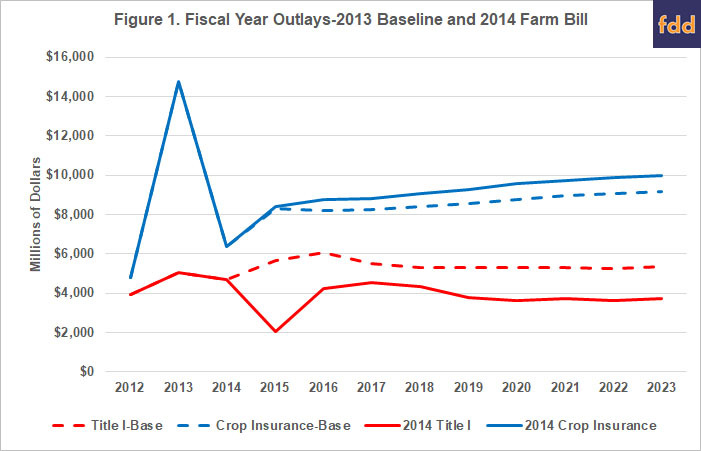 Figure 1 illustrates the shift by comparing the May 2013 baseline (dashed lines) for the commodities title and crop insurance with the CBO score (solid lines) for the final legislative product in 2014 (CBO, May 2013 Baseline; CBO, Jan. 27, 2014). In anticipation of an updated CBO Baseline, two recent developments are relevant. First, as discussed previously, lower crop prices have reversed the scoring expectations for commodities and crop insurance in the 2014 Farm Bill (farmdoc daily, Feb. 1, 2018). The Ag Committees will not have to pay for changes that increase farm program spending due to lower prices. Similarly, they will be unable to take credit for any savings–such as reductions in outlays for crop insurance–nor will they be able to use the savings to offset new program demands. Second, the Bipartisan Budget Act of 2018 made three specific revisions to existing farm bill programs: (1) added seed cotton as a covered commodity for ARC/PLC; (2) changed the dairy Margin Protection Program’s premium schedule and coverage calculations; and (3) removed the spending cap for livestock crop insurance policies (farmdoc daily Feb. 14, 2018). Based on CBO’s score of the changes, seed cotton will net $148 million in outlays during the 10-year budget window. The dairy Margin Protection Program will increase outlays by $794 million and the changes to crop insurance will add $308 million in outlays over the 10 fiscal years that will constitute the baseline (2018-2027) (CBO, Feb. 8, 2018). Congress explicitly waived PAYGO and other budget discipline rules; the spending will be added to the farm bill baseline without need for offsets (H.R. 1892, Bipartisan Budget Act of 2018, section 70101). The CBO Baseline for a 2018 reauthorization will take into account these and other changes to the authorized programs. CBO is expected to release the updated baseline soon and it will control any effort to reauthorize the farm bill in 2018. The new baseline will reset the terms of the policy competition in a farm bill reauthorization based on the programs as they are and the forecasts used for the ten-year budget window. Waiver or relaxation of the rules for budget discipline is highly unlikely for the farm bill debate and any increases in spending will have to be offset by corresponding decreases. How this might impact the debate and the implications for policy can be illustrated with recent decisions by USDA. First, the Farm Service Agency (FSA) announced that it would renew cotton ginning cost-share payments for the 2016 cotton crop (USDA-FSA, Mar. 9, 2018). Under Administrative PAYGO rules, this increase would have to be offset, which calls attention to a previous decision by the Risk Management Agency (RMA) to eliminate the option to purchase 10% higher prevented planting coverage (RMA, Informational Memorandum, Dec. 4, 2017). This change to crop insurance would reduce Federal spending and it is likely that the changes to crop insurance prevented planting coverage provided the offset for the cotton ginning program (Haire, Mar. 3, 2018). To better understand this, more detail on each of these USDA decisions is provided below. The December 2017 decision eliminated the option for farmers to purchase 10% higher prevented planting coverage (Clayton Dec. 11, 2017; RMA, Informational Memorandum, Dec. 4, 2017). USDA justified the change by referencing a 2013 report by USDA’s Office of Inspector General and a 2015 study by Agralytica Consulting (USDA-OIG, 2013; Agralytica, 2015). While it can vary by crop, prevented planting policies often establish coverage based on a factor of 60% of the coverage level purchased by the farmer. For example, if a farmer has a 75% revenue insurance policy, an indemnity for prevented planting would be 45% of expected revenue. Before the change by USDA, farmers could elect to purchase an additional 5% or 10% prevented planting factor, boosting coverage from 60% to 65% or 70%, respectively. USDA had previously proposed eliminating both the 5% and the 10% buy-up options in 2016 and 2017. The FY2016 USDA Budget Summary indicated a savings of $108 million and total savings of $1.4 billion over 10 years (USDA FY2016 Budget Summary). The FY2017 USDA Budget Summary indicated savings of $84 million with total savings of $1.1 billion over 10 years (USDA FY2017 Budget Summary). One news report indicated that the savings from eliminating the 10% buy-up option was expected to total $410 million (Brasher, Dec. 13, 2017). The updated CBO Baseline should include the impact on crop insurance outlays due to this administrative revision. The Ag Committees likely will not receive credit for any estimated reduction, however. With insurance policies, it is difficult to forecast what the impact will be in a given year because indemnities depend on acceptable causes of loss, which for prevented planting indemnities include cold wet weather, drought, excess moisture/precipitation/rain, failure of irrigation and flooding. 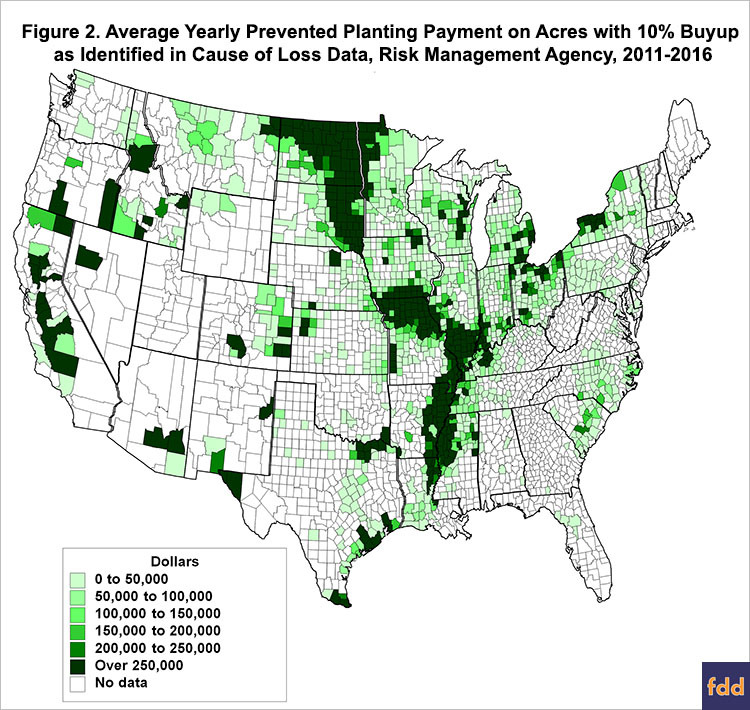 Figure 2 maps the average yearly prevented planting payments on acres with the 10% buy-up option for 2011 through 2016. These are the areas expected to be most impacted by the USDA changes. 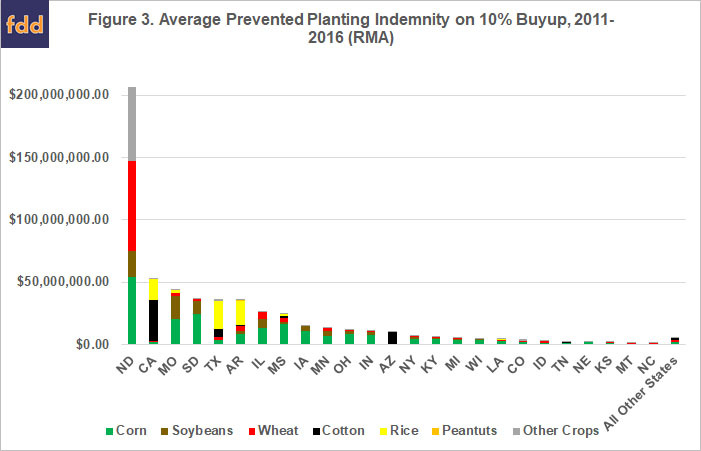 To provide further perspective on the map in Figure 2, Figures 3 and 4 break down indemnities for the 10% buy-up option in prevented planting coverage. 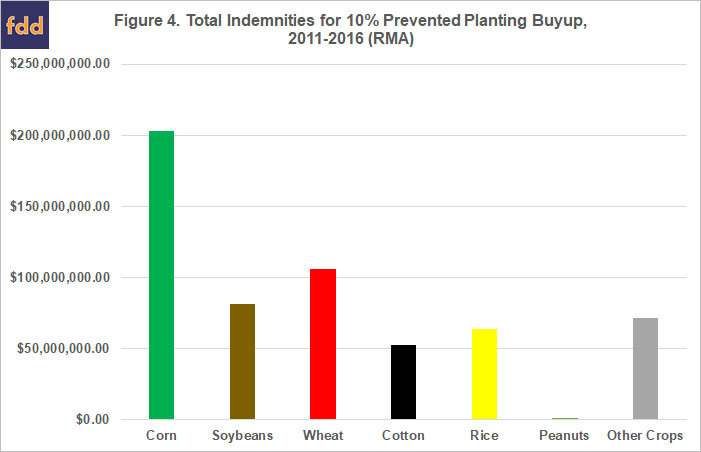 Figure 3 illustrates the average of the prevented planting indemnities by crop and state for the 10% buy-up option for the years 2011-2016. Figure 4 adds the total by crop of the average indemnities for the years 2011-2016 for all states. The indemnities in Figures 2 through 4 are based on data from the Risk Management Agency (RMA, Cause of Loss Historical Data Files). Based on these figures, the decision by USDA to eliminate the 10% prevented planting buy-up option would be expected to have the greatest impact in North Dakota. The change would also be expected to have the biggest impact on corn. Of course, the actual impact to farmers will depend on weather in the coming years. On the heels of the crop insurance changes and the addition of seed cotton by Congress, FSA announced that it would renew cotton ginning cost-share payments for the 2016 cotton crop (FSA, Mar. 9, 2018). 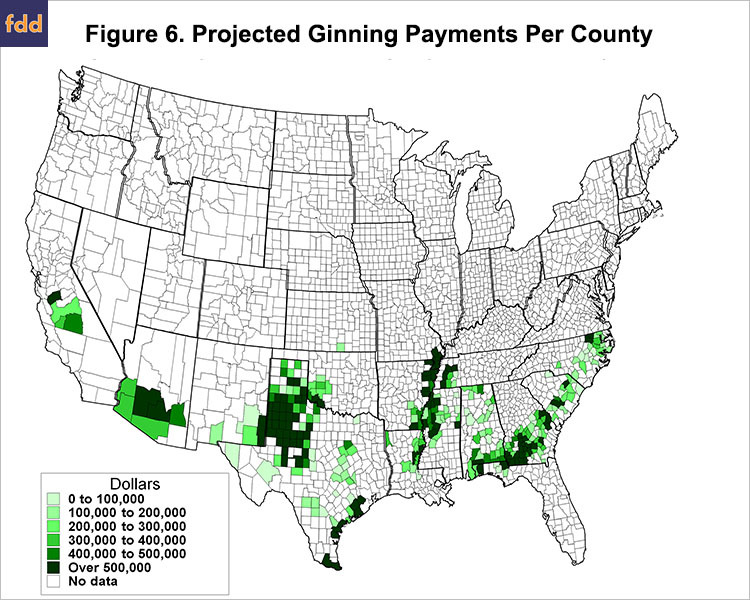 The one-time payments will be calculated using 20% of regional ginning costs and paid on the acres reported to FSA as planted to cotton in 2016 (Regulations.gov, March 7, 2018). The table below was created from the FSA information for the payments. (FSA, Program Fact Sheet). There is no publicly available score for this assistance. Figure 5 uses the acres planted to cotton in each state and the payment rate per acre to estimate the total payments per state. In total, this would result in just over $220 million in cotton ginning cost-share assistance payments for the 2016 crop of cotton. 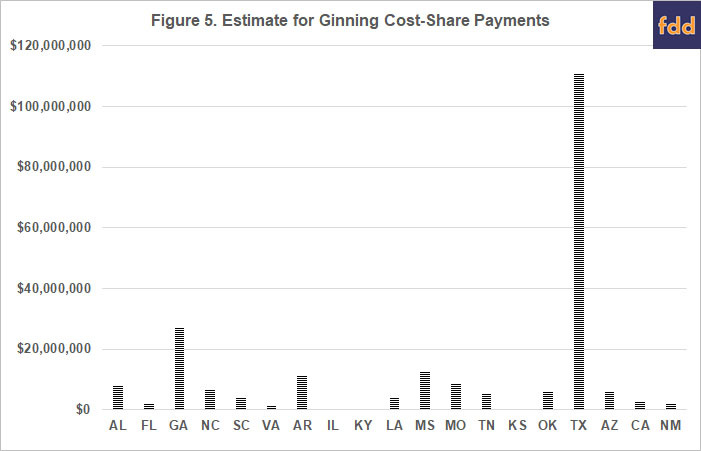 Finally, Figure 6 maps the expected Ginning Cost-Share Assistance payments based on acres planted to cotton in each county and the payment rate for the state. In total, these figures demonstrate how the need for offsets impact policies but also the impacts on the geographical and crop distribution of assistance. If the changes to prevented planting crop insurance were used to provide an offset for the cotton ginning cost share payments, USDA’s decisions are likely to shift funds from North Dakota and corn farmers to cotton farmers in southern states. If Congress seeks to increase spending for Title I farm program payments in the upcoming farm bill debate, budget discipline rules will require reductions in other programs to offset the costs. Competition for limited baseline funds could create additional pressure on crop insurance outlays; increasing commodity programs at the expense of crop insurance coverage similar to USDA decisions discussed herein. Using crop insurance as an offset bank to fund priorities in Title I would reverse the policy trends from the 2014 Farm Bill. Doing so will also have different impacts on different crops and states as highlighted by the shifts in expected outlays from the northern Great Plains and corn farmers to southern states and cotton farmers. Such impacts will add further difficulties to negotiating a farm bill by increasing political pressures and challenges within the farm coalition. Coppess, J., C. Zulauf, G. Schnitkey, and N. Paulson. "Reviewing the State of the Farm Bill: Perspective from Spending." farmdoc daily (8):16, Department of Agricultural and Consumer Economics, University of Illinois at Urbana-Champaign, February 1, 2018.